flour. Hispano-Muslims had four types: 1. wheat meal. This was the most common in the Middle Ages. It was stone-ground and sifted. It became whiter with repeated siftings. 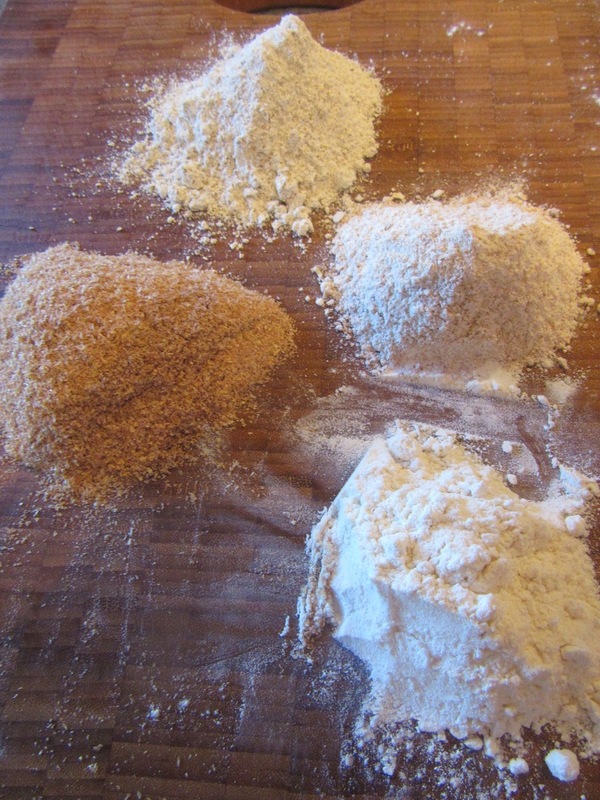 2. semolina; 3. red flour lightly ground and bolted (Ar. juskār, Cast. madhūn, almodón). 4. wheat baking flour previously moistened with water. These types were the bases for popular porridges, soups and sauces such as Ar. bulyāt (porridge made with Ar. bainy, millet bread) and harira (below). In other parts of Spain and England, wheat was not as plentiful as in Al-Andalus during Middle Ages and frequently there were wheat famines from which Andalusia did not escape as in 1301, 1413, 1434 etc. Flour could be made from acorns, almonds, barley, Bermuda grass, broad beans, buckwheat, chickpeas, tiger nuts, durum wheat, fava beans, grass peas, linseed, lentils, lupins, millet, peas, rice, sesame, sorghum, spelt, walnuts, or water chestnuts. Some of the flours are beneficial such as almond flour, while others like rye were dangerous as it is susceptible to ergot (see ergotismo). Some were most detrimental such as grass peas (see almortas). Combine flour and oil or animal fat. (The original recipe does not recommend animal fat as it goes rancid.) Add 1 c hot water little by little. Add yeast if desired. Knead well until it can be stretched like an elastic band without breaking. Peel almonds. Pound them in a mortar or a food processor combining the same amount of almonds as sugar until the consistency is like paste. Add spikenard and cloves. Dissolve mastic and camphor in rosewater. Knead until all the ingredients are well mixed. Grease a stone surface with oil. 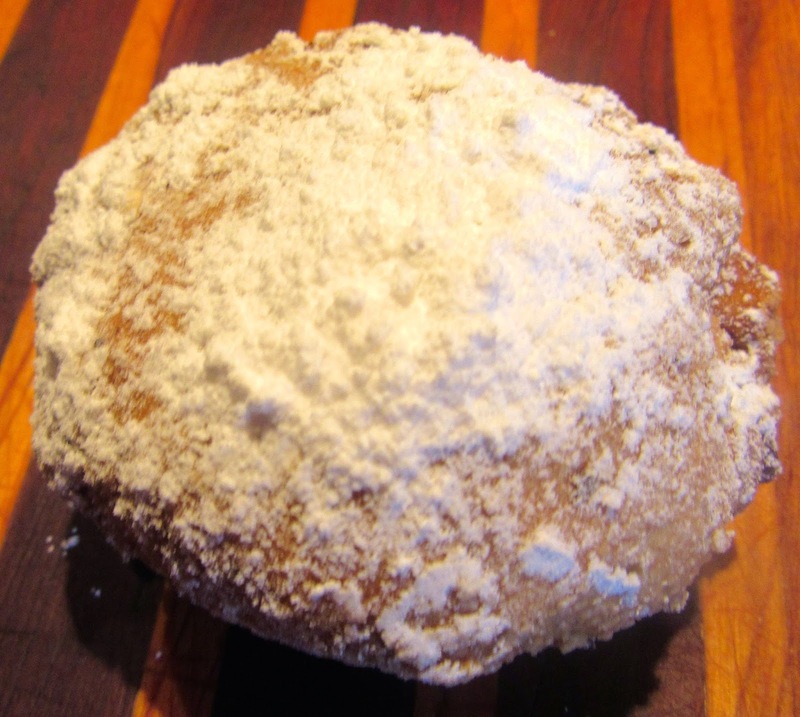 Make doughnuts with the dough. Slice them in half and push each half down in the middle. Fill each half with the stuffing weighing a little less than the dough. Put one of the halves on top of the other and pinch and roll the two halves back together. Place each filled doughnut on a greased cookie sheet. Bake 30-60 minutes depending on the size and the oven. Se humedece la harina candela o la sémola, según la regla citada, con aceite o con grasa o con aceite que sobre, porque la grasa, si sobra, huele y toma amargor; luego se le vierte agua caliente poco a poco y se amasa en seco y se extrema su sobo hasta que se adelgace y se iguala de manera que se toma un trozo de ella y se extienda, de modo que al extenderse no se rompa y el que quiera, pone en él un poco de levadura o lo deja; luego se toma almendra descascarillada y azúcar en partes iguales y que sea el azúcar más que las almendras; se maja hasta que sea como una masa y se pone en una escudilla; se le añade espliego y clavo en la cantidad necesaria y un poco de mástico, y algo de alcanfor disuelto en agua de rosas; se soba con él el relleno hasta que se mezcle, luego se engasa una salāyacon aceite y se hace la rosquilla sobre ella con esto y se mete en su interior este relleno, igual por igual, luego se le barre un sitio en el horno, lejos del fuego y se mete en él sobre una tabla limpia, en la que se deja hasta que tome su punto; se saca y se hacen con la masa de la rosquilla diversas formas, como la clase que se llama en Bugía jaškalān y el jaškalān es otra clase, cuya mención vendrá después de ésta; se hace con ella alcorzas rellenas, pequeñas y grandes, y figuras, gacelas y demás. Moisten fine white flour or semolina, according to the aforementioned rule, with oil or clarified butter, and it is more delicious and keeps better with oil, because clarified butter, when kept long, smells and becomes bitter. Pour in hot water little by little, and knead it until it is dry, and continue kneading it until it is supple and ripe, so that when a piece of it is taken and stretched [or possibly rolled] out, the stretching does not break it; and he who wishes may put in a bit of yeast, or leave it out. Then take of peeled almonds [p. 67, recto] and sugar equal parts, and the sugar could be more than the almonds; pound this until it is like a dough, and put it in a bowl. Add spikenard and cloves in the necessary amounts, and a little mastic, and some camphor dissolved in rosewater. Knead the filling with this until it is mixed; then grease a stone work surface with oil, and make a ka'k on it with the dough, and bury the filling inside it, in equal amounts. Then clear a place in the oven, far from the fire, and place the ka'k in it on a clean slab, and leave it until it is done and ready. 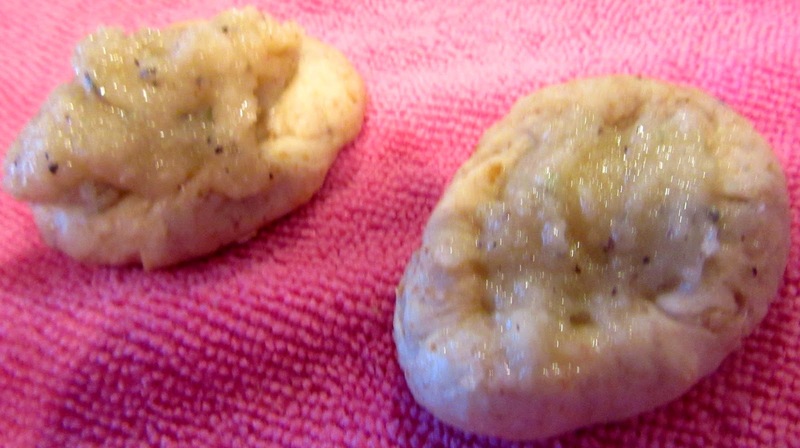 Take it out and make various shapes from the ka'k dough, like what is called khushkalân in Bougie. The khushkalâ n is another kind of dish, which will be mentioned after this. Make filled qursas (round flat loaves), small and large, and forms of birds, gazelles and the like. In pharmacies and nature shops, it is called "Arabic gum." 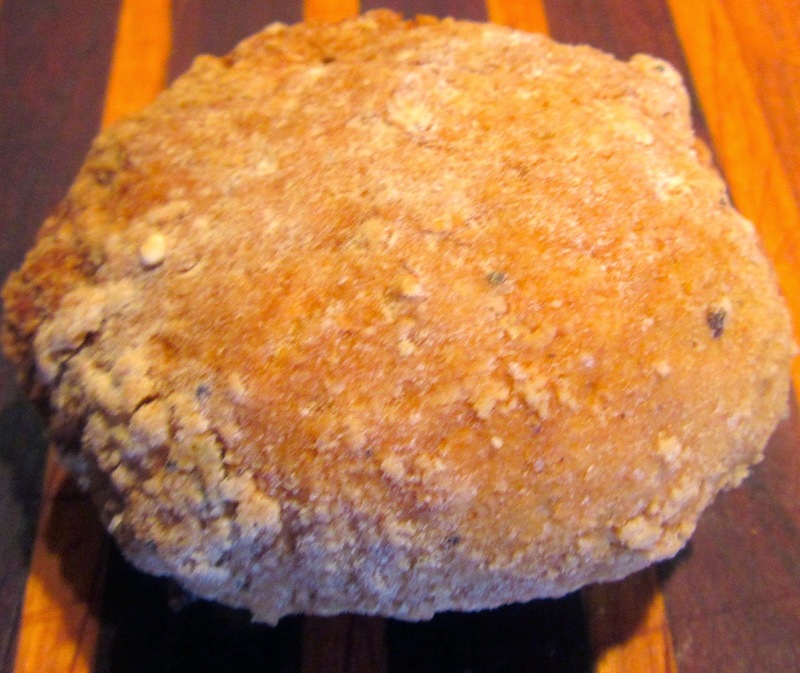 As this is moth balls, the Spanish Medieval Chef has omitted it from ingredients. It is ghastly! Note: only the mastic was dissolved in rosewater as camphor was not used. en árabe ka’k or ka’ak. De sala – canlentar, piedra caliente, que sustituye en est parte el rescoldo – gada – usado en la primera. (Perry ftn 177) Here we seem to have a recipe from a source that doesn't like rancid clarified butter. Khushkalân is called "khushkanân" in the Syrian and Iraqi cookbooks, a form closer to the original Farsi "khoshknân," literally "dry bread. "(CP).